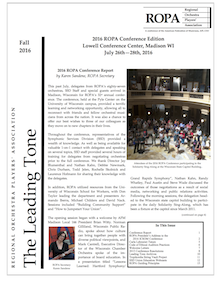 The Leading Tone is the official newsletter of the Regional Orchestra Players Association, a conference of the American Federation of Musicians of the United States and Canada, and is published quarterly. Hard copies are distributed to member orchestras in limited supply. PDF versions from the past several years are archived here. Additional volumes available upon request.